Uncategorized – Hearne Steel Company, Inc.
You can find informative posts, important Hearnes Steel updates, and more! Where should you put your gate? Comments Off on Where should you put your gate? 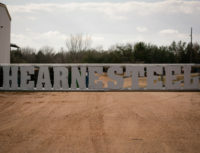 Hearne Steel was founded in 1957 by brothers, Rubin and J.C. (Cannon) Amos. With just one employee, they manufactured bands from a self-made machine for only Texas sales. The company now has over 60 employees and ships nationwide. © Copyright 2009-2018 by Hearne Steel Company, Inc.